Re: What computer/OS are you using? Glad you got your iMac back together! Dang, I didn't even know you could install Leopard on an iBook G4. Yep; Leopard was the last release of OSX to support PowerPC. It's a little slow in some regards, but it's not much different than my iBook G3 running OS9, and in fact, they both boot up in roughly the same time. - The previous iMac: Bulbasaur, my bondi blue G3, and the fleet's first ever Mac [2010-2011]...although I nearly had a Mac SE and an iMac G4 a few years prior. - Beginning of 2k-tan V1.7: Glass shattered in shipping (Was chipped at the edge in the auction photos), no OS installed, refused to connect to wifi, but everything else functioned. - Vintage and modern collide: Broken glass removed and disposed of. Sonata [iBook G3] connected to internet over ethernet, functioning as an unsecured wifi hotspot; iMac connects to it with ease and successfully enters OSX Internet Recovery...but fails because I never purchased Lion. - One trip to SimplyMac specifically to get a FireWire cable later...: Fuuka [Mac Mini] being used as a boot drive via Target Disk Mode. Runs Snow Leopard, but had a bootlegged Lion installer from when I was setting up Asagi II years ago; allowing the iMac to boot independently. iMac is officially given the name "Fuuka2k-tan". Bonus pic of how I loaded it in my car; yes, I did buckle it in to keep it from sliding around. - "Mac? PC? I'm both": Windows 7 installed via Boot Camp, upgraded to Sierra from Lion, and rainbow Apple logo decal added to the front. That means I lose IR remote functions...but I pretty much never used that feature on my older Macs, so it's no big loss. - Bonus pic of an iMac G3 I saw at Goodwill, the day I got the FireWire cable. 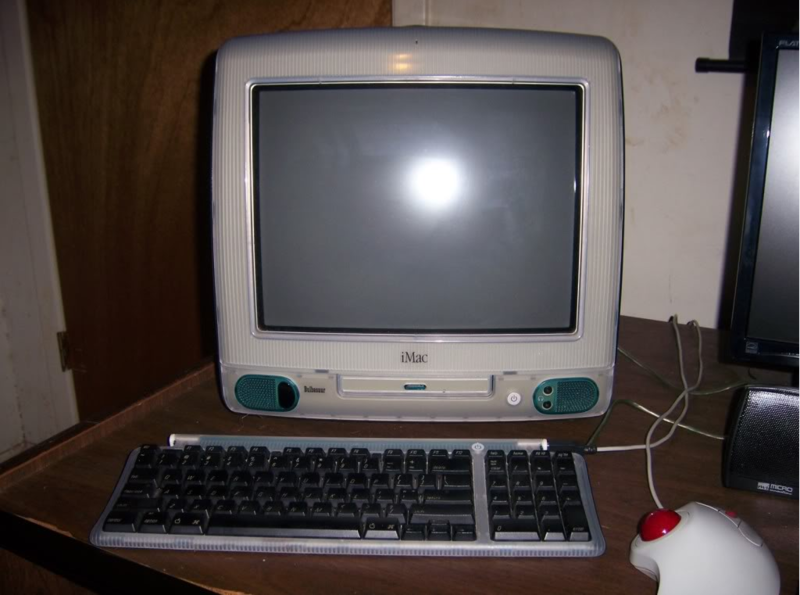 They also had a few PowerMac G4s; two of the original model, and two Quicksilver models...and I wish I had bought one of them, as by the time I finally decided to just do it, they were gone. That came out really good looking, Pent! Excellent work. Seconding Stew - great work getting 2K-tan V1.7 restored! I got dumped a couple of somewhat older Dell Inspirons into my hands and now I'm just figuring out what to do with them. One has a Pentium in it so I'm probably just going to install either Win7 or WinXP on it for legacy stuff like quake and diablo 2. Other one we have had around the house for a while and its got an early gen core i5 in it, I can probably use it for hashing but I'll only be getting around $0.15 a day off of it so not really that great. I'm waiting for a decent Pentium 4 machine to walking into the recycle pile at work soon enough so I can make that into either a win2K legacy machine or another WinXP one. After watching Lucky Star again, I've really got a earning for the "old" days of windows xp that were really enjoyable for me. Windows 10 is pretty nice and the features that it brings to the table like the automatic driver installation, auto network printer detection, and moderately okay legacy support keeps me content. Maybe its not so much the software that I miss but the communities that were around at the time that I enjoyed visiting and all the time I spent on sites like 4chan just laughing at the craziness that went on. Most of the old guard of the internet has left us and the new generation moving in really isn't sitting well with me in how the internet is shaping to be thanks to them. To much politics, to much bickering that stems from so much IRL things. I miss the good 'ol days when I could jump into a random forum and just see people bickering about the newest 480p torrent of anime that was being seeded through the IRC channel. Oh well, I can just go back to winXP and boot up Diablo 2, the servers are still up anyway. Glad that this place is still around even though we had that little scare not to long ago, I hope to see us stick in our corner of the internet for a long time to come. Quote from: Penti-chan on June 09, 2017, 10:08:23 am I heard the i9's only real benefit is for video editing and 3D modelling; stuff that's very heavy on CPU usage. TBH, I don't see much of a need for it over the i7 for your average user (In fact, I'm fairly satisfied with the i5 in my iMac; it may not be quite as strong as the i7 that was in 2k 1.0, but it's leaps and bounds beyond the AMD-A4 that was in 2kME). TenFourFox keeps my PowerMac G4 alive! And a hex editor I use for hacking it! I have socket 478 Pentium 4s coming out of my ears! Please take them they are all less than 1.5GHz clock speed though! ^ I nearly bought a PowerMac G4 the other day at Goodwill; they had 4 of them, $10 each (Two of the earlier graphite model, and two Quicksilver models). I was on the fence, since I was still in the process of fixing up my iMac, but by the time I decided to just do it and grab one of the Quicksilver models, all 4 had sold. I don't think I've ever seen a Goodwill with a computer in it. Which is probably good for me as I would impulse by some old Mac everytime I went. I kind of hate Apple but I have a weird soft spot for collecting their old hardware. The larger Goodwill about an hour away has a corner called the "Computer Center"; where they sell refurbished Dells and occasionally have used stuff for sale (Generally, fairly cheap; bring your own hard drive). It's hit and miss; generally you'll mostly see gutted Dells that barely have enough pieces to work with, but occasionally something cool slips through the cracks, like the aforementioned PowerMac G4. The one in my hometown only has a shelf with some Dell keyboards, and nothing else of note. I also have my primary laptop, Moonglow, which also runs Windows 10. I just finished treating the case for rust (Due to a pipe busting and leaking into the room I had this stored in), and finally have it put back together. The hard drive, though, is on its last legs, so I'm going to replace that soon. I think I'll just list all the computers I have currently out and named. I then have my absolute load of laptops. I also want to mention that I have some VPS servers with Vultr. PM me if you want a signup link or something. Hongo is a general server, while Ichimonji is meant to be a personal git server for syncing in a cloud-like fashion. This video got me to do this for what I write on my more modern computers. Doesn't work as well when I bring older computers into it, but the text-basedness allows me to use various programs, and I got floppies, so I can just sync to a networked computer that way.